The Cookery in downtown Fish Creek offers a variety of options. Although it had always been known as a breakfast hot spot, the restaurant suffered a devastating fire in 2008, which forced the Skare’s to update the Door County classic. The restaurant re-opened in June 2009 after much anticipation. The restaurant has expanded to include a second floor, water view wine bar. 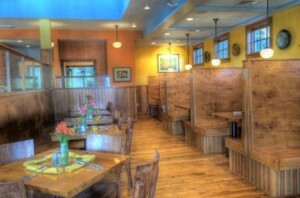 It is now 85 seat restaurant that also includes lodging and a full line of jams and sauces. The restaurant now serves lunch and dinner seven days a week as well as breakfast on Saturdays and Sundays throughout the summer. Check out the Cookery’s Website for the most updated menus as well as the live entertainment calendar during the summer season. Unfortuneatly, The Cookery will be closed this winter but will reopen in April.